Fan Replacement | Perfex International Pte Ltd - Radiators, Charged Air Coolers, Heat Exchangers and Oil Coolers for power generation and other industries. Every radiator’s impeller is crucial to its efficiency. It keeps the radiator from overheating by charging the air in the radiator’s environment over the fins. It is necessary to immediately replace impellers that have malfunctioned, so as to prevent blown gaskets, engine failure, and costly repairs. In Perfex, we have a full range of customizable impellers to suit your application. 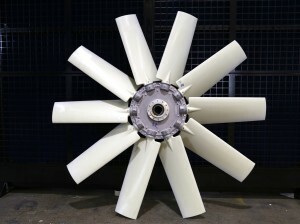 The impeller’s interchangeable components employs a broad range of blade profiles. Our impellers have a diameter range of 300mm to 2,740mm that use pressure die cast aluminum alloy hubs, and are available in the following industrial materials: glass reinforced polyamide, glass reinforced polypropylene (PPG), aluminum (AL), industrial strength glass reinforced polyamide (PAGI), electro anti-static nylon (PAGAS) and super tuff nylon (PAGST).